If you’ve purchased a vintage motorcycle that was simply in need of a tune up and a cleaning and your goal is to just get it roadworthy, there are a few items you should always consider replacing. Replacing a few key items on your old motorcycle will ensure it will be safe to ride and prevent any major failures or tuning issues once you start riding it regularly. Keep these parts in mind when your looking at a bike you might buy. The first items on the list include the components in the motorcycle’s final drive – the front sprocket, the rear sprocket, and the chain. Inspect them all to determine if they are past their wear limits. If the bike has been sitting for a long time, the chain is bound to be rusty or at least caked in dirt and grime. It should be replaced. Over time, sprocket teeth will wear down along the sides. If it gets bad it could cause your chain to slip or jump when the bike is in motion. That’d be bad. A general rule of thumb is to replace both front and rear sprockets at the same time so that they wear evenly together. You should also replace the old lock washer that go under the nuts for the front and rear sprockets. They may be brittle from rust and bending them back to remove the sprockets only makes them weaker. Again, even if the tread looks fine on your old motorcycle’s tires, tires that have been sitting in one place for a long time should be replaced. For tube-type tires, you should usually replace the tubes any time you change the tires. You may need to loosen the bead with heat or penetrating oil as tires that have been sitting for a while tend to bind to the rim. Once everything is off, inspect the inside of the rim for signs of rust and pitting. Clean it as best you can. When many old bikes are parked to sit for the last time, many parts are usually well worn out. Brakes are no exception. During any rebuild, it’s a good idea to disassemble and inspect both the front and rear brakes. More often than not, they’ll need a thorough cleaning. Often, the front brake caliper piston will be seized in its slot. You can remove it by hooking up the caliper to a functioning front brake master cylinder with the brake caliper removed from the disc. Pump the MC until the brake fluid pushed the brake piston out of its hole. Remove the rear wheel to get at your motorcycle’s rear drum brake. The rear shoes and springs are typically sold as a unit and should be replaced. Replace the front brake pads as well. Drain and remove all the old oil from the front forks and the engine. Refer to your motorcycle’s shop manual for the proper oil weight to replace them with. Both the old engine oil and fork oil are subject to breaking down as moisture, grime, and gasoline seeps past seals or down cylinders over time. Replacing the engine oil regularly will increase the life of your engine’s internal parts. Replacing the fork oil will improve your bike’s handling and front suspension. 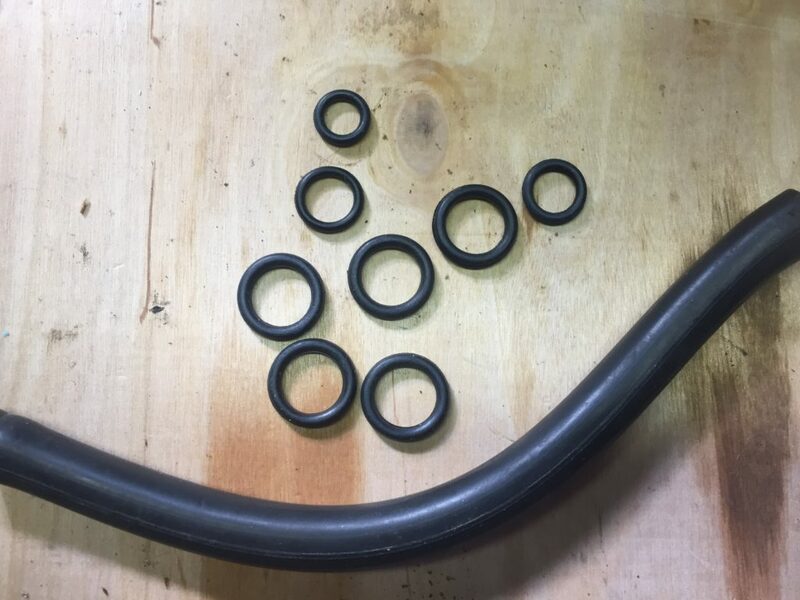 Just like the tubes and tires, other rubber parts on your motorcycle may need to be replaced due to age and exposure to different types of elements. Over time, carb boots become extremely hard and small cracks can form. The hardening makes it difficult to install and tighten the carbs. The tiny cracks lead to vacuum leaks in the carb circuit that will cause you RPMs to race and never come down, and in the worst cases destroy the engine with a too lean condition. Including fuel lines and o-ring. Just like carb boots, o-rings and fuel hoses get hard and crack over time, which can lead to fuel leaking onto your hot engine – no good. These five sets of items are the minimum you should consider replacing when you’re rebuilding an old motorcycle. All of them will help improve the safety of the bike and eliminate a slew of tuning and performance issues you might encounter otherwise.